Join us for sports, arts & crafts, technology, group activities, and a whole lot of fun! 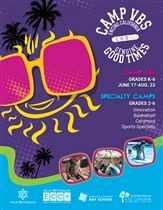 Click here for Online Registration For Camp Kef 2019! Camp Kef, which means "fun" in Hebrew, is a variety Day Camp for Grades K-6 providing an array of activities and experiences led by our dynamic counselors. Each week there will be a variety of special activities at Camp VBS, including a Super Shabbat Celebration. Lunch is provided to all campers each Friday when camp is in session. *Specialty Camps are open to 2nd - 6th graders! NEW THIS YEAR: 10 full weeks of camp, new specialty camp options, and brand new state of the art indoor gym. Click here to view a welcome greeting from Rabbi Deborah Schuldenfrei. The Howard and Irene Levine Community Center - Coming in 2019! Click here to learn more about the Howard and Irene Levine Community Center. Click here to read our Annual Report 2017-18.